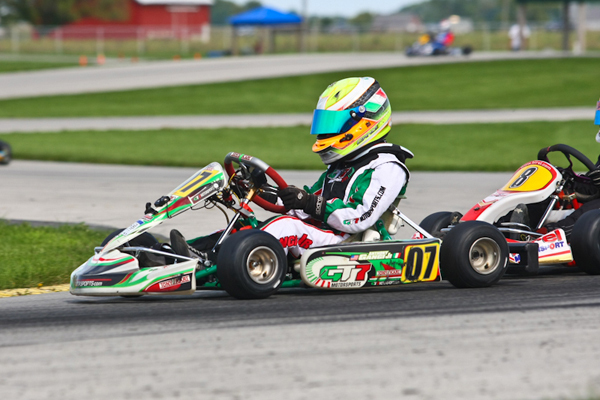 Wrapping up his 2012 World Karting Association (WKA) Manufacturer's Cup program, Anthony Gangi Jr. would head to the New Castle Motorsports Park facility in New Castle, Indiana for the finale round this past weekend. Taking on the competitive Cadet Junior Sportsman class on both Saturday and Sunday, the GT7 Motorsports/Tony Kart pilot would show speed to run at the front of the 23-kart pack, but difficulties in both finals stripped the 2012 United States Rotax Mini Max National Champion of the elusive race wins. Circuiting the one mile course Saturday for the first day of competition, Gangi Jr. would clock second quick in the morning qualifying session, just a scant 0.051 seconds off the pole position time. Taking charge during the opening stages of the eight-lap prefinal, Gangi Jr. would be relegated from the lead to P3 just past the halfway point. Holding station from there, the karting hot shoe maintained his position to finish third and secure an excellent inside row two starting position for the final. Taking over the second position at the start of the final, disaster would strike for Gangi Jr. on lap seven. Out of contention for the win with a DNF, Gangi Jr. would look to Sunday for a fresh day. Bettering his qualifying effort from Saturday, Gangi Jr. would put his Tony Kart on the pole position with his fast lap of 47.647 seconds, earning the elusive Fast Time pole award. Maintaining point in the prefinal, Gangi Jr. would be passed on the last lap, relegating him to P2 despite being the fastest kart on the track. A fight for the race win would ensue in the 14-lap final, with Gangi Jr. holding the lead until he was bumped back to second by lap seven. Battling for podium positions, Gangi Jr. would be involved in contact on the last lap of the race. Finishing the race third, Gangi Jr. would receive a driving infraction penalty for the encounter, placing him 21st overall. Gangi Jr. would like to thank Chris Perez, his tuner and coach for the past four years, for his help and support during the entire WKA Man Cup series, as well as his sponsors Millwork Solutions Inc., PKT Axles, Holeshot Drive Systems and GT7 Motorsports. Gangi Jr. will next take in a special event at the same New Castle facility, as the GT7 Motorsports crew will battle it out in the Yamaha Junior Sportsman Money Race during the same weekend as the prestigious 200 lap RoboPong 200 October 13-14. Gangi Jr. will then wrap up a successful 2012 season at the grandest event on the karting calendar, the 16th running of the SuperKarts! USA SuperNationals, set for November 13-18 in Las Vegas, Nevada.